Painting is one of the easiest and the quickest ways to give a makeover for your kitchen. However, for those who are planning to paint their kitchens for the first time, the idea could be pretty daunting. Some tips below can help boost confidence and make the whole affair an easy one. The first step in any paint job is selecting the right color. 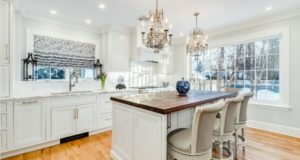 While it is a very personal choice, different colors convey different feelings and therefore it is important to understand what exactly you want your kitchen to say. 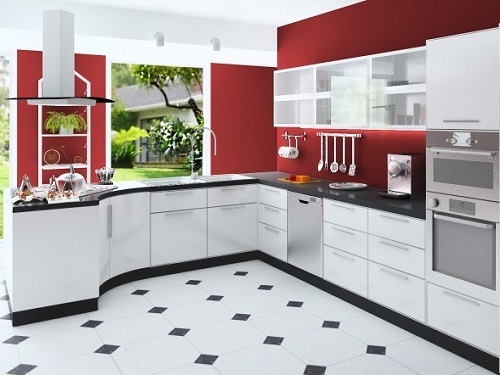 If you want a bright and cheerful kitchen, red is a good choice. 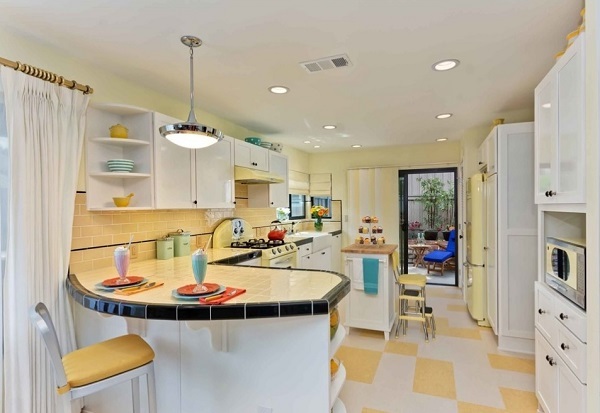 For a mood lifting kitchen go for shades of yellow. For a calming experience go for blues and whites. 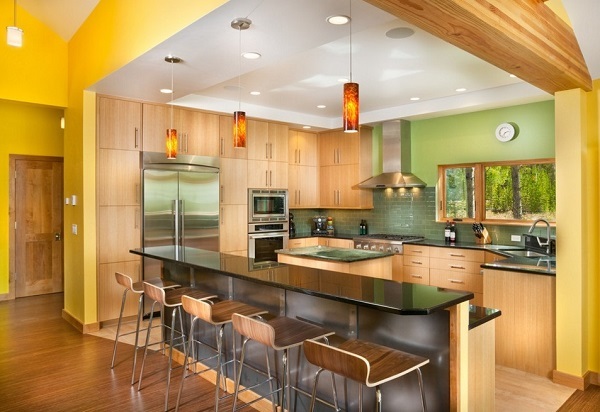 Shades of green will lend a soothing touch to the kitchen. Similarly for large kitchens go for darker color tones while in small spaces lighter tones and pastel shades are advisable. Paints come is a variety of finishes. Some are matte which means that after application it will not have any shine. Gloss paint shines after application while satin is between the two. From the point of view of a kitchen, the matte finish is difficult to clean while gloss is easy but then gloss is over the top shiny and you might not want it in the kitchen. Whatever you select, never compromise on quality. Kitchen being an area where there is high traffic and cleanliness is important, the paint you select should not chip or peel away with little wear. It will be a good idea to make one wall as focus. This one can be of a different color than the rest of the kitchen so that it attracts attention and becomes the focus wall. The focus wall can be of any color that you like; just make sure that it blends well with the rest of the color palette. A kitchen is bound to have some wood work, some stone on the counter, tiles on the floors etc. The wall space to paint is actually very little but it is important that whatever color you choose matches with all the other existing elements in the kitchen so as to lend a harmonious look. If the wood work is dark, then the paint palette should be lighter and vice versa. You could also experiment by highlighting certain areas of the kitchen. For instance the wall area inside the cupboard or behind the cooking range can be of a different color. 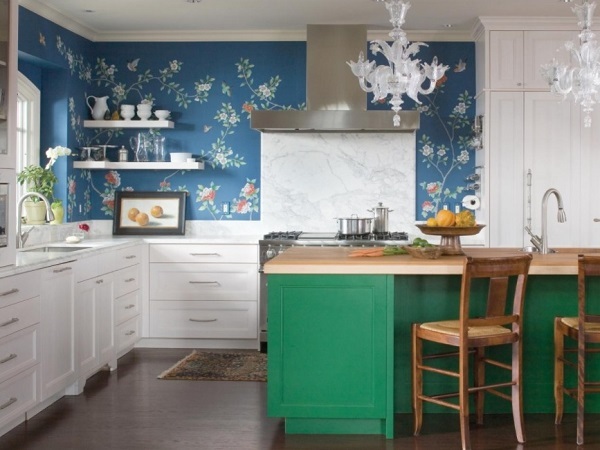 If you have metallic finishes in your kitchen go for greens and blues. Wood work gels well with warm tones of reds and yellows. Instead of keeping the walls plain, you could put stickers or stencil out patterns on them. The stickers and stencils could be around the kitchen theme with pots and pans and ladles in them. You will need to place them in multiples with adequate spacing for the best results. Pay full attention to wall preparation and ensure that you do not cut corners here. A well prepared base is the key to a good finish in the final coat. While preparing the wall, pay special attention to any dampness near the basin area and oil marks around the cooking range. 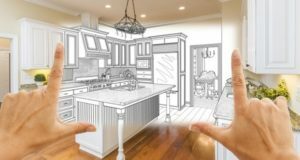 With these tips in mind, it will not be difficult for even a first timer to do a great job with paint and give a makeover to the kitchen.